The Jolla smartphone includes NFC, but only to communicate with its detachable back cover. “The NFC antenna on the phone is solely dedicated for the connection between the device and its back cover,” Jolla told NFC World. The phone runs Jolla’s own Sailfish operating system and can run both Android apps and dedicated Sailfish apps. The €399 (US$540) device boasts a 4.5-inch HD display, eight megapixel rear camera and 16GB of internal storage. 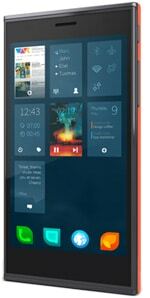 Jolla the company was founded by ex-Nokia staff and Jolla the phone can be thought of as a successor to Nokia’s well-regarded N9, with Sailfish being a descendant of the Meego operating system. The Jolla started shipping in limited quantities in late November 2013.